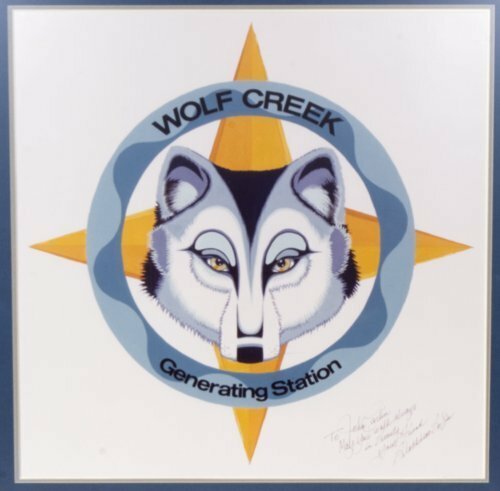 Wolf Creek Nuclear Generating Station corporate insignia designed by artist Blackbear Bosin. Completed in 1985 after years of debate over nuclear power, the Wolf Creek Generating Station is located near Burlington, Kansas. Plant owner's commissioned American-Indian artist Blackbear Bosin to design this corporate insignia. In the mythological design, he included the wolf, a great provider, and the Sirius Star, a symbol of heat, to promote the positive aspects of the plant. Bosin was born of Kiowa and Comanche heritage in Oklahoma. He served in the Marines during WWII and worked as an illustrator in Wichita. This poster, signed by Bosin, was given to Governor John Carlin for his support of the Wolf Creek Station.